Since I posted weebles yesterday, I thought I’d post something else today for variety. This watercolor piece came together very organically, out of the rich pigments in my Japanese paints and my own random thought processes. 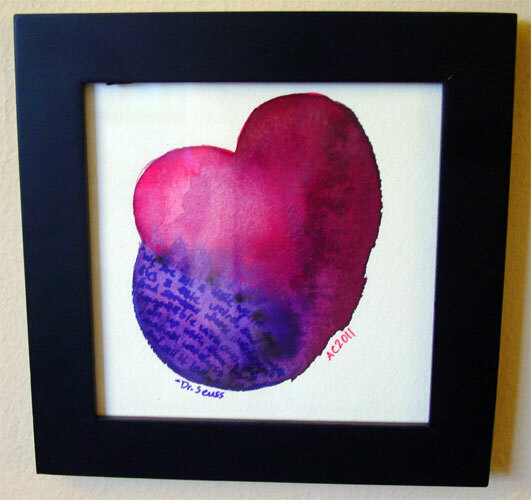 I started out painting a very pink heart, and when that didn’t suit me at all, I added the deep red along one side, and then the half-circle of purple nestling up next to it. The wet pigments ran and mixed to create something much more interesting, textures that kept evolving until they’d dried completely. A touch of the original fuchsia shows up in the left lobe of the heart, and so when I signed it, I chose a fuchsia fountain pen (also from Japan) to echo that. The piece felt incomplete, however, so when I found this quote about love from Dr. Seuss, I wrote it into the curve of the half-circle with a violet fountain pen, knowing from experience that the ink would blur and run. Though it’s nearly impossible to read, I think the words add layer of visual meaning to the piece. 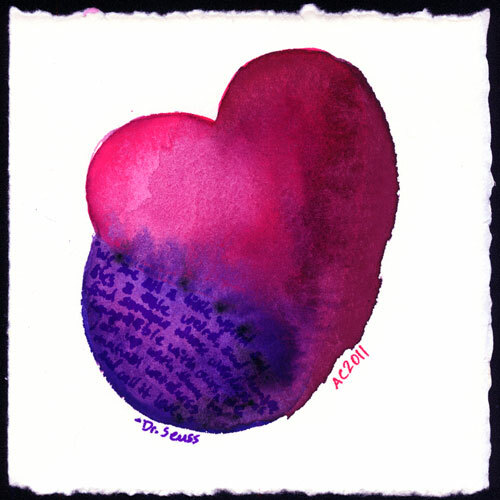 Seuss Heart, 5″x5″ pen and ink and watercolor on Arches cover white paper. You can also get this piece printed on a handmade card on Etsy. i like this! there is a color, there in the middle, that is my pinkyred streak color 🙂 you caught 3 of my fav colors and put them together! Thank you! I’m not always comfortable with pinks, especially the bright fuchsia of the pigment here, so it’s good to know that it worked to challenge myself here. i find a similar phenomenon with knitting, if i am working with a color that makes me feel MEH, the pattern will most likely not sing to me. so to use up that yarn, i usually have to pick a pattern i’ve already found tested-and-true! Well, sometimes if I force myself outside my color comfort zone, I’ll end up somewhere familiar, but oftentimes I end up with pieces I work on more than the usual, going back to them four or six times, which loses spontaneity but adds polish. It’s always a balance!